Agrimonia is a member of the Rose Family. The plant grows to 6 feet in height and has leaves that are dark green, and hairy on top and lighter underneath with toothed margins. Leaves grow to 2 inches in length and have up to 11 leaflets per leaf. The plant typically grows in rich soil in pine forests and along streams at elevations between 6500 - 8500 feet. 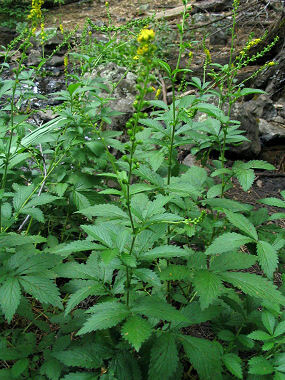 The Agrimonia in these pictures was photographed near Sycamore Canyon southwest of Flagstaff. 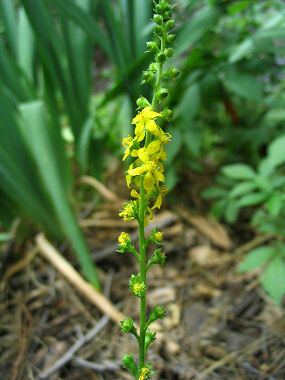 Agrimonia blooms between July - September and produces yellow flowers with 5 petals to 5/16 inches in width that grow along a slender spike.